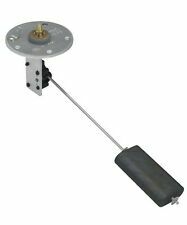 Moeller Fuel Tank Sender Electric - 6" to 12"
FUEL LINE ASSEMBLY #5008609. EVINRUDE - JOHNSON. SAE J30R9 Rated Hose. REPLACES THE FOLLOWING FUEL LINE ASSEMBLIES 1300 Town Line Rd. (Rt. 60). Mon: Closed. Sun: Closed. Mundelein, IL. 7 Ft x 3/8 In. Kink-Free Hose. Maximum Fuel Flow. Double Check Valves. NEW JOHNSON EVINRUDE DUAL CARBURETOR REBUILD KIT. Replaces Johnson Evinrude#. FITS: Johnson Evinrude. Includes components to rebuild 2 carburetors. 140 HP 1977-1983. 125 HP 1971-1972. 85 HP 1969-1979. This sale is for 1 (one) new UNIVERSAL fuel line assembly. These hoses are made by Sierra and are the Silverado 4000, #18-8017EP-1. 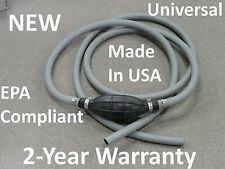 These hoses carry a 2 year manufacturer's warranty. All product is new! 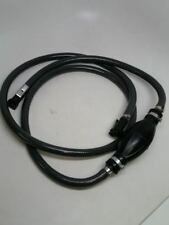 This is a Marine Johnson/ Evinrude 3/8" Fuel Line which is made of alcohol resistant material with a hose length of 7ft. The rubber primer bulb and hose allow greater fuel flow to maximize performance. It is compounded to accommodate today's alcohol-enriched gasoline blends. It is compatible with the Ethanol blended fuels fully as well. Item: PM153018 *Please note every computer shows colors differently. All measurements are approximate. Pactrade Marine is a US based distributor of marine and RV lighting and accessories. We strive to provide our customers with the best products and customer service. Copyright © 2014 Pactrade Marine. PART NUMBER #5008609. From our new parts inventory here at Vans Sport Center. CANT FIND A CERTAIN PART YOU NEED?. WE MIGHT JUST HAVE IT. This is a Marine Johnson/ Evinrude 3/8" Fuel Line which is made of alcohol resistant material with a hose length of 7ft. The rubber primer bulb and hose allow greater fuel flow to maximize performance. It is compounded to accommodate today's alcohol-enriched gasoline blends. It is compatible with the Ethanol blended fuels fully as well. Item: PM153018 *Customers please note every computer shows colors differently. All measurements are approximate. 12oz Yamalube ring free plus fuel additive. • Removes deposits from fuel injectors, carburetors, intake valves, intakes ports, and combustion chambers. • Specially formulated for e10 fuels. JOHNSON 2000 SJ25RTSSB Rope Start, Tiller, 15 IN. JOHNSON 2000 J40TPLSSM Elec. Start, TNT, Tiller, 20 IN. JOHNSON 2000 J25TESSD Elec. Start, Tiller, 15 IN. Genuine Johnson/Evinrude/BRP (Bombardier) 5/32" fuel hose. Sold by the foot (12"). Length (overall): 5 3/4"Width: 1 5/8" Connector: 3/8"(10mm) Material: rubber and aluminum Color: Black Engine Type : Diese,Gas, petro Item: PDSA0151-10 *Customers please note every computer shows colors differently. All measurements are approximate. NEW YAMAHA TRIPLE CARBURETOR REBUILD KIT. Includes components to rebuild 3 carburetors. 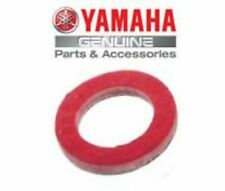 Fits Yamaha V-4 & V-6 Models 1986-2001. Replaces Yamaha#. FITS: Yamaha. 115 HP 1986-1995. 130 HP 1988-1995. Yamaha ATV. OEM #: 881540. Replaces 881540,18-7979. 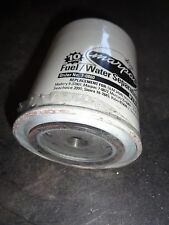 4-Stroke Fuel Filter. Even if you think you have the original carburetor it is best to confirm this with the numbers on the carburetor. Their carburetor is actually a 1981 not a 1982. One year off can make a difference in the kit you need. Item Description This is a black rubber jumbo primer bulb for outboard fuel tanks fits with 3/8" hose. The primer bulb and hose allow greater fuel flow to maximize performance. Compounded to accommodate today's alcohol-enriched gasoline blends. Item: P40061. THIS IS A 90 GPH / 10 MICRON FUEL WATER SEPARATOR. FUEL/WATER SEPARATOR. YAMAHA OUTBOARD. Central Marine is run by boaters, for boaters. Central Marine's experienced staff will help you find the right part or outboard for your specific needs. Kit includes filter, bracket, (2) aluminum 3/8 hose barbs, (2) aluminum 3/8 NPT plugs 11/16" Spin on filter threads. 10 Micron filtration removes contaminants & water. Interchanges listed are a GUIDELINE only. 1 x Fuel Line Assembly. Fully compatible with Ethanol blended fuels. What is included. HP/Model Serial # Year Carburetor Model #. 7.5 hp 3274633 & Up 1972-1985 BB-2A, BB-2B, BB-2C, BB-4A, BB-5A. 20 hp 3537531 & Up 1973-1980 BA-1A, BA-2A, BA-2C, BA-2D, BA-2E. 9.8 hp 3263263 & Up 1972-1985 BB-1B, BB-1C, BB-3A, BB-3B, BB-3C. 58-1299 Yamaha 150-250 Hp HPDI Fuel Filter. Yamaha VZ-TLR VMAX HPDI Power Trim / Tilt Electric 20 In. Yamaha Z-TLR HPDI Power Trim / Tilt Electric 20 In. Yamaha Z-TXR HPDI Power Trim / Tilt Electric 25 In. Intake|Carb|Fuel. Intake|Carbs|Fuel. Intakes|Carb|Fuel. Needle|Seats|Tools. Complete Rebuild Kits. Basic Kits. Venom Starters. Riva Racing|R & D.
1 x Fuel Line Assembly. Fully compatible with Ethanol blended fuels. PART# 3H6702002M OR 3H6-70200-2. NEW FOUR STROKE TOHATSU OR NISSAN ENGINE FUEL LINE ASSEMBLY. OMC / JOHNSON / EVINRUDE. Pactrade Marine Rubber Fuel Pump Hand Large Primer Bulb Fuel Hose Boat Marine Car RV. Primer Bulb for 1/4 inch ( 6mm ) Hose. This Black Primer bulb made by rubber. The Dimension for this item is 6'' x 1 3/4''. In addition, providing more output while maintaining fuel flow that exceed all outboard manufacturers’ requirements. Frequently used as a hand pump in boats for fuel supply to the out-board engine. Compatible with Ethanol blended fuels. ---Primer Bulb for 1/4 inch ( 6mm ) Hose ---Color: Black ---Material: Rubber, Metal ---Dimension: 6'' x 1 3/4'' ---Frequently used as a hand pump in boats for fuel supply to the out-board engine ---Suitable for boats, RVs, tractors, and caravans. Sierra fuel water separators remove over 99.8% of emulsified water from your gasoline. All filters flow @ 90 GPH to feed even the hungriest motor. Free 1 pair of Premium Guard Nitrile 8 mil black gloves. Nissan Tohatsu. Boat Marine Female Fuel Line Connector. OEM CROSS 3B2-70281-0. Johnson Evinrude part #398453. Johnson Evinrude 4.5hp, 1982-1984. Johnson Evinrude 4hp, 1983-1993. Johnson Evinrude 4.5hp, 1987. Johnson Evinrude 5hp, 1984-1985. Johnson Evinrude 7.5hp, 1982-1983. Johnson Evinrude 6hp, 1984-1985. Replaces OMC Part #: 382048, 383052, 383067, 398532, 439071. Carburetor Kit for Johnson & Evinrude Outboard Motors EMP Part # 1300-08647 New carb kit for various Johnson and Evinrude outboard motor applications. Applies to all Yamaha outboard components with matching 8D paint code. Factory matched colors. It replaces part # 42909A1, 42909A2, 42909A3, 42909A4. 100 HP 4-Cyl 0B209468 - Up Models with white fuel pump body. 115 HP 4-Cyl 0B209468 - Up Models with white fuel pump body. 1/4" NPT Aluminum Fitting 3/8" ID Tube. Marine Fuel Tank Pick-Up. Harvard Marine. 24" Length. Replaces 881540. OEM #: 881540. 4-Stroke Fuel Filter. Outboard external fuel tank is anti-static, anti-aging, corrosion-resistant red plastic fuel tank. Adapter 9.9 horsepower outboard engine models can be used for a variety of models of outboard machine. New fuel pump repair kit for Johnson and Evinrude outboard motor applications as detailed in the chart below. Fuel Pump Repair Kit for Johnson & Evinrude. V6 235 1983. 20 & 25 Hp 1977 - 1986. 9.9 & 15 Hp 1981. NEW JOHNSON EVINRUDE DUAL CARBURETOR REBUILD KIT. Includes components to rebuild 2 carburetors. Replaces Johnson#. FITS: Johnson. Fits outboards 18-75 HP 1970 & Newer. Rider Accessories. Bike Accessories. It replaces the following Johnson / Evinrude part numbers 0382363 (Float). 382363 (Float). It contains the parts pictured to rebuild 1 (ONE) carburetor. Carb Rebuild Kits. Intake|Carb|Fuel. Intakes|Carb|Fuel. This is a mercury fuel line assembly, and it is made of alcohol resistant material. 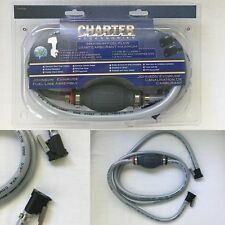 The complete fuel line assembly includes 7 ft fuel line hose with large primer bulb and fuel line connectors for tank and engine. The rubber primer bulb and hose provide greater fuel flow to maximize performance. It is compounded to accommodate today's alcohol-enriched gasoline blends. It is compatible with the Ethanol blended fuels fully as well. ---Made of alcohol resistant material ---For 3/8" hose barbs ---Length: 7ft ---Item: PM153012 *Customers please note every computer shows colors differently. All measurements are approximate. BF35 BF40 BF45 BF50 BF75 BF90. 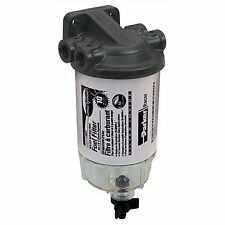 SIERRA FUEL FILTER ASSEMBLY, REPLACES HONDA 16900-SA5-004. HONDA MARINE ENGINES. Each tank features a 90 degree 1/4" NPT fuel fitting making it easy-to-read and slash resistant. This product is great for export, not EPA approved. Each of these tanks also virtually eliminates fuel evaporation and loss by containing fuel vapor within the tank instead of venting it wastefully to the atmosphere. 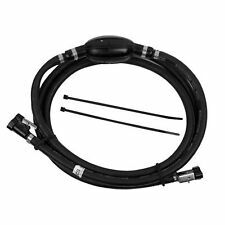 NEW JOHNSON OMC DUAL DOUBLE 2 LINE PRESSURE FUEL GAS TANK HOSE w/clamps PER FT.